LONDON– 22February 2017 – ‘100% Egyptian Cotton’, a fashion installation featuring Egypt’s best emerging designers, was for the second year part of the International Fashion Showcase 2017 presented by Mercedes-Benz. Egypt was the only Arab country to be represented in this year’s showcase and became the most-visited stand at the event. 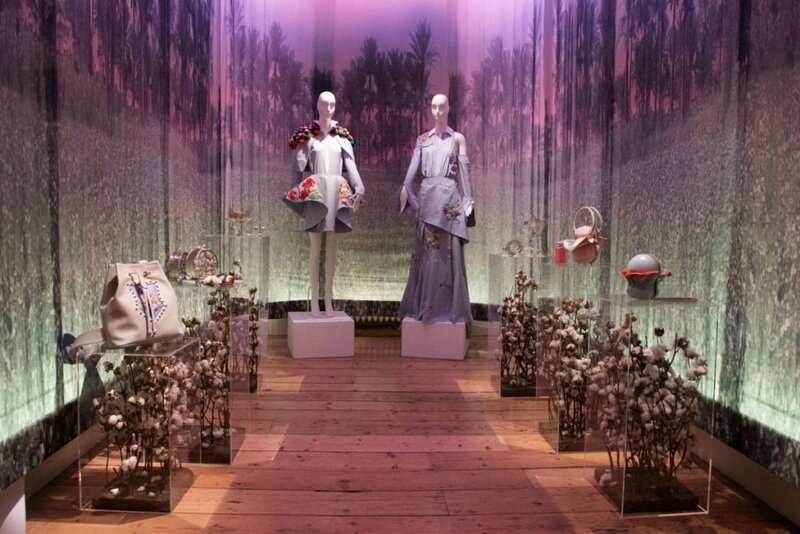 The ‘100% Egyptian Cotton’ installation was been extremely popular with visitors and attracted an array of fashion royalty, including legendary British fashion journalists Suzy Menkes, OBE, Sarah Mower and Hillary Alexander, OBE. The influential fashion journalists were extremely impressed with the installation and spoke to the six designers in depth. Organised by the British Council, British Fashion Council and Mercedes-Benz, in association with London Fashion Week, the theme of IFS 2017 was Local/Global. The annual showcase was held from 17 – 21 February at Somerset House in London. The exhibition was curated by Susan Sabet, who is thefounder and editor-in-chief of Pashion Magazine, and one of the top 500 most influential people in the fashion industry according to the Business of Fashion. The exhibition was supported by British Council Egypt and Commercial International Bank – Egypt (CIB),thelargestprivatesectorbankinEgypt.SaharabyShahiraFawzyprovidedthe Egyptian cotton for the installation, designed by Egyptian interior design company Living In. The wondrous landscape of Egypt’s countryside, the colours of the earth, and the stunning pink and blue Egyptian skies set the backdrop for an unparalleled fashion experience. This year’s showcase attracted a record number of people, exceeding last year’s numbers of 10,000. The Egyptian designers were selected based on meeting the requirements of the British Fashion Council, as well as creative and quality standards, to compete on an international level and to represent Egypt in the best way possible. Each designer created one to two one-off pieces based on their interpretation of 100% Egyptian cotton, spanning from the lifecycle of the cotton plant to the ready product for the accessory and jewellery designers. The two ready-to-wear designers took the classic men’s shirt in 100% Egyptian cotton as the starting point for their pieces and embellished them with colourful floral embroidery, referencing the clothes of the young farming women picking cotton flowers. Click here to see images of the designer’s pieces on display at the 2017 International Fashion Showcase. In addition to Susan Sabet, the exhibition team included the mother and daughter team of Alia and Tamara El Tanani of Living in Interiors who are responsible for the exhibition’s interior design. Their family-owned business is Egypt’s leading design firm that provides its clients with integrated, bespoke lifestyle of brand culture and taste in exteriors and interiors for residential, commercial and public spaces. Daki Marouf directed the project management for Egypt’s exhibition. A managing partner of Sabry Marouf and fashion business consultant, Mr. Marouf is actively engaged in the fashion and interior sectors, having managed major projects in Cairo, London, Dubai, and Doha. As the country’s leading private sector bank,CIB offers a broad range of products and services for institutions, households and high-net worth individuals through 180 branches across Egypt. In addition, CIB is the bank of choice for over 500 of Egypt’s largest corporations and has a designated platform catering to the needs of Small and Medium Enterprises. CIB is equally committed to the Egyptian community, through corporate social responsibility initiatives, the CIB Foundation, sustainability programs, as well as, participation in major national events. Its initiatives and programs, that span fine arts, music, social care, and sports, have a profound impact on the lives of its community by encouraging active participation in society and nurturing talent of the youth population. CIB is the exclusive sponsor of Cairo Symposium, the Annual Egyptian Youth Salon and Upper Egypt Salon. The British Council is the UK’s international organisation for educational opportunities and cultural relations. The British Council creates international opportunities for the people of the UK and other countries and builds trust between them worldwide. The British Council works in more than 100 countries and its 7,000 staff – including 2,000 teachers –works with thousands of professionals and policy makers and millions of young people every year by teaching English, sharing the Arts, and delivering education and society programmes. Sahara by Shahira Fawzy is an Egyptian design house founded by anthropologist Shahira Fawzy. Sahara translates notions of old Cairo into sustainable, luxury textiles and homeware. Sahara is credited to being one of the first Arab designers who specialises in incorporating traditional Arabic patterns, art motifs and the art of Arabic calligraphy. All products are Egyptian-made and ethically sourced. The Sahara shop also exhibits unique collections of jewelry and traditional costumes. The IFS is a series of specially commissioned and curated fashion installations featuring work by emerging designers from all over the world. Since 2012, 550 of the most exciting international designers from 70 countries have exhibited as part of the initiative. IFS responds to London’s reputation of promoting and supporting new talents in the creative industries by providing opportunities for designers from overseas to engage with the UK fashion community and build international connections. The theme of this year’s exhibition was Local/Global. Countries were invited to explore the influence of place on fashion and to examine how emerging designers can transform their local culture into a global language. Fashion is shaped by its surroundings: the rhythms of nature, climate, cultural memory, social change and historical shifts are reflected in silhouettes, techniques and materials. The peculiarities of place give rise to different ways of designing, making and wearing fashion. By considering fashion within their own landscape the countries taking part in IFS highlighted the similarities and differences of our complex and connected world. To reflect how fashion is influenced by its surroundings, the West Wing Galleries at Somerset House, were transformed by Studio Toogood using panels of stretched agricultural tarpaulin, neat stacks of bricks and fabric panels dyed with London clay. An emerging generation of international designers and curators invited visitors to share their countries’ visions of Local/Global. The exhibition was arranged over 15 rooms, 14 of which represented a country. There was one group installation, ‘Next in Line,’ curated by Shonagh Marshall which featured designers from 10 further nations. In a dedicated space, Mercedes-Benz showcased six emerging designers the brand has previously supported through its International Designer Exchange Programme (IDEP). As part of its ongoing global fashion commitment, Mercedes-Benz continues to support, nurture and mentor young and emerging design talent through the IDEP, which offers up-and-coming designers a unique opportunity to present their collections outside of their local markets to an international audience. A series of business support seminars, organised by London College of Fashion, also helped designers prepare for the showcase. The Designer Support Programme brought together a network of LCF affiliated academics and researchers, offering mentoring opportunities and business development during IFS. A collaboration with Fashion Scout also offered designers involved in IFS the opportunity to show their work on the catwalk. A prize-giving ceremony scheduled for London Fashion Week February 2017, chaired by a panel of industry experts announced the winning Country, Designer, and Curator. The panel was headed by Sarah Mower MBE, BFC Ambassador for Emerging Talent and Chief Critic at Voguerunway.com. For the first time, Mercedes-Benz additionally presented the winning Designer with the unique opportunity to showcase his or her collection at one of the currently more than 50 Mercedes-Benz Fashion platforms. The IFS is a cultural exhibition, which is free and open to the public during London Fashion Week, an important part of their public-facing programme. TAKAHIRO UENO 2012-13 A/W ACCESSORY COLLECTION “It’s better to burn out than to fade away”.